Manufacturing in Oklahoma accounts for about 10 percent of the total output in the state. Doing the math, one can quickly see what an important the role manufacturers play in the overall Oklahoma economy. This is where the Oklahoma Manufacturing Alliance enters the picture. The Alliance helps small-to-medium sized manufacturers become successful through a partnership with business leaders, education and government agencies. The Alliance helps connect Oklahoma-based manufacturing entities to a network of local, state and even national resources aimed to deliver information and services. The result is strong communities throughout Oklahoma built through innovative and growing manufacturing. The Alliance provides a full-range of services to manufacturers to help implement change in five critical areas: technology, marketing, human resources, finances and inter-firm collaboration. Educational programs, marketing leads, data analysis and even assistance on obtaining certification for manufacturing excellence are a just a few of the specific types of support available. One of the unique keys to the success of the Manufacturing Alliance is its network of Manufacturing Extension Agents located throughout the entire state. These agents are particularly valuable in the rural areas where assistance and opportunities may be limited. These agents provide a variety of services for companies in their home region as they assess the needs of their clients and assist in meeting those needs and finding solutions. Working closely with CareerTech centers, the agents can often coordinate appropriate programs and training that are available through public and private resources. The Alliance also employs a wide network that includes public agencies as well as private consultants that can assist companies with a number of issues ranging from financial analysis to market expansion. “In Oklahoma, our manufacturing base serves all five economic sectors: energy; aerospace/defense; bio-agriculture/ bio-sciences; transportation; and financial/ internet technology,” Dave Rowland, President of the Oklahoma Manufacturing Alliance, explains. The Manufacturing Alliance utilizes the “Oklahoma Innovation Model” to respond to manufacturers’ technology needs. Under the Model, the Manufacturing Alliance partners with the Oklahoma Center for the Advancement of Science and Technology (OCAST), i2E, and New Product Development center at Oklahoma State University. The concept is that each of the partners brings a specific expertise to the table that in turn, results in a technology-based “one-stop shop” for the state’s manufacturers. In looking to the future of manufacturing in Oklahoma, Rowland points out three technologies that he anticipates will change Oklahoma manufacturing in the next two to five years. Rowland notes more than 85 percent of all business is marketed and done through some sort of social media or digital mechanism. “You are not really selling a product in today’s environment; you are solving someone’s problem with your product or service,” he explains. “We have to train our manufacturers and give them the tools on how to be problem solvers in today’s digital world. We have to catch up on this. But the good news, most of them recognize this need and are ready to engage,” Rowland adds. This concept is basically taking advantage of big data and utilization of the internet. Examples, according to Rowland, include machines talking to machines and people interfacing directly and communicating using data. Additive manufacturing, or 3-D printing, is becoming more common every day. “In Oklahoma, we service the energy and aerospace industries where our type of additive manufacturing is going to have to be done in metal. Metal 3-D printing is still in the early formative years, but this is going to be a big change in these two sectors. We will need to develop this technology,” Rowland explains. 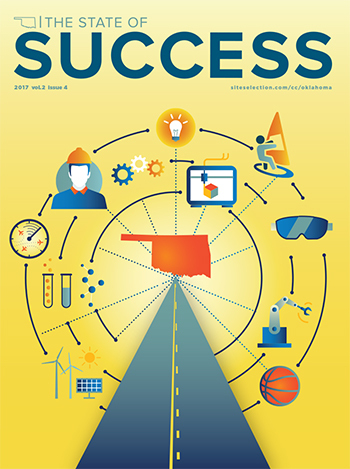 Two case studies illustrate the important role that small-to-medium sized manufacturers play in Oklahoma’s economy. Mertz Manufacturing, located in Ponca City, has just over 200 employees and is growing even more as the oil and gas industry is rebounding. Welders, painters, machinists, assembly mechanics and steel-cutting and forming workers make up the bulk of their workforce. Business is so good, they are currently in the market to hire more welders, machinists and painters. Mertz designs and builds a wide range of custom steel fabricated products, the majority of which are specifically designed trailers to serve as the mobile platform for specialized equipment used in the oil and gas industry. “All of our products are custom designed and built to our customers’ specifications for the quantities and delivery times our customer requires. Mertz has consistently been able to work with our customers to find unique and affordable solutions to these complex problems,” owner Steve Ballinger explains. Ballinger says that the company is constantly focused on improving its processes. “We have embraced the principles of Lean Manufacturing, Six Sigma, Root Cause Analysis and Continuous Improvement in all we do,” Ballinger explains. “All employees are encouraged and incented to submit Quick Kills (quick actions toward improvement in cost, safety or quality) with awards and a celebration of winners conducted monthly,” Ballinger adds. Johnson Controls, Inc. (JCI) is another Oklahoma manufacturer that recognizes the critical importance of technology as well as employee involvement. The Norman factory, with approximately 1,000 employees, produces commercial air conditioning and heating units, the types you often see on rooftops of retail businesses, restaurants or schools. Steve Maddox, Vice President of Engineering, explains that their commercial HVAC products are designed, engineered and assembled all under one roof in Norman. “This enables team collaboration to create the best products in the industry. Controls are a critical part of every HVAC product. Our control systems defines the efficient and reliable operation of our units. Our controls take the complexity out of unit installation and operation which benefits the installing contractor and the end user. Maddox points out some of the advanced technologies utilized by JCI. JCI has also taken advantage of the Oklahoma Center for the Advancement of Science and Technology (OCAST) programs. “We have worked with Oklahoma State University to work on advanced technologies and advanced modeling tools that help increase our competitiveness in the marketplace,” Maddox explains. These assessments identify company’s strengths and weaknesses, including financial analysis and performance benchmarking that can reveal technical or industry-specific issues. Applications engineers from Oklahoma State University also work with the alliance to assist manufacturers with their engineering and technology needs. They can analyze failures, processes, equipment, products, plant layouts and designs. Also, it can help companies grow by assisting them in analyzing markets, product developments and sales and in laying out strategic plans to succeed. Or it can help them become more profitable by assisting them in identifying work tasks or other technological issues that cost them money. Finally, the alliance organizes local manufacturing councils that give companies a chance to talk about common challenges and to share ideas. Rowland predicts the alliance during the next few years will focus on bringing out emerging technologies like next-generation robotics and automation, additive manufacturing, supply-chain management, predictive data modeling and digital marketing.